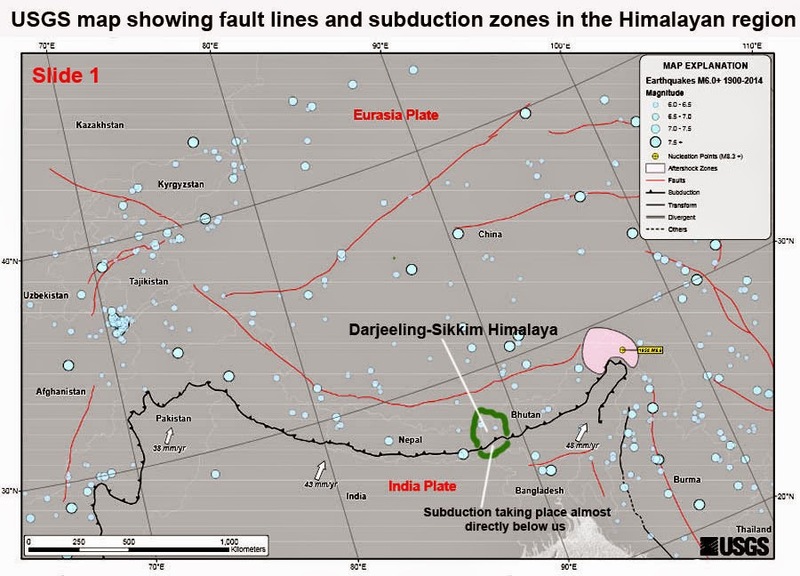 The USGS is undeniably one of the most authoritative bodies in the world, when it comes to seismic studies. 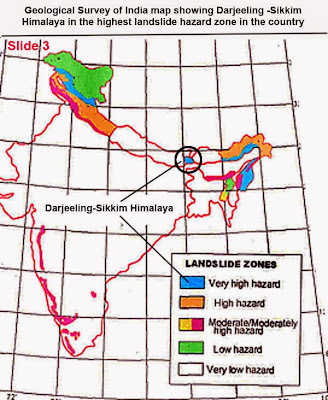 In its tectonic summary of the Himalaya and its vicinity, it states "The northward under thrusting of India beneath Eurasia generates numerous earthquakes and consequently makes this area one of the most seismically hazardous regions on Earth." 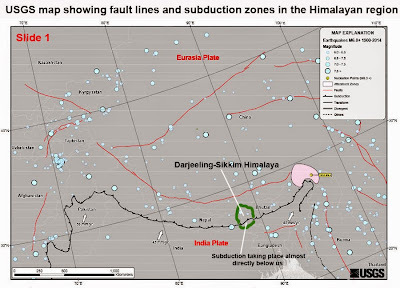 Unfortunately, the subduction zone running from Kashmir to Arunachal Pradesh (see map above or pdf file here) passes almost directly below where we live (Darjeeling-Sikkim position in above map is approximate and not from USGS). 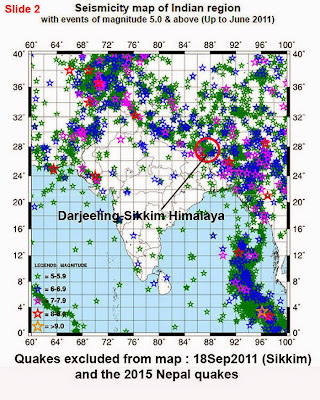 In India, the IMD is responsible for seismicity of the region and the seismic map of India with a focus on the Darjeeling-Sikkim region is placed above. 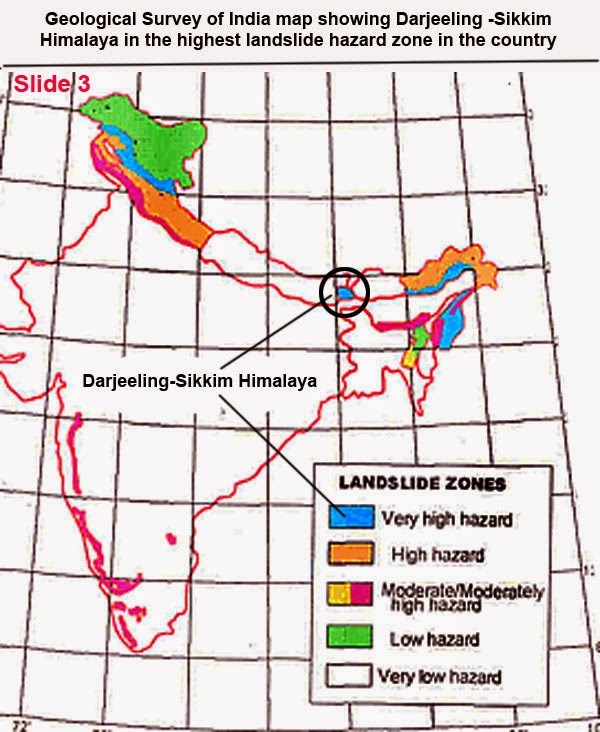 The GSI is the nodal body in the country looking after landslide hazards and as per them, the Darjeeling-Sikkim Himalaya is amongst the most hazardous areas (see above) in the country with regard to landslides. Placed above is his map on fatal landslides in Asia and without a doubt, he states the most fatalities in the world due to landslides takes place along the ' southern edge of the Himalayan arc' - which is, sadly where we live. 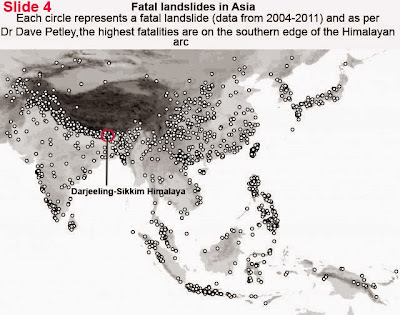 What never ceases to amaze me is how in the face of such stark, cold scientific evidence and the huge spurt in disaster along the Himalayas, we still continue to bury our heads in the sand and think disasters can happen to everyone - except us.